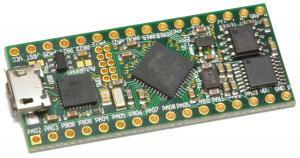 Atmel/Microchip SAM D21 microcontroller module with USB UART, RS232 and RS485 transceivers. Sammy-D21 Plus V1.0 is a versatile and very compact/small (just 18x38mm size!) microcontroller board with the SAMD21G18A microcontroller, CP2102 USB UART converter, RS232 transceiver and RS485 transceiver. All relevant controller signals are available on pin headers. 16MHz XTAL and 32768Hz TOSC watch crystal are included. A low-power, high-performance Atmel/Microchip ARM Cortex-M0+ based flash microcontroller, the Atmel/Microchip SAM D series is ideal for a wide range of home automation, consumer, metering, and industrial applications. New: The Sammy-D21 Plus can be ordered with preloaded chip45bootSAM Bootloader. With the free chip45bootSAM Windows GUI the application (hex file) can be uploaded through USB. No additional programming tool is necessary.